Tease me once, shame on you. Tease me twice… shame on me. Eldar Avatars keep popping up in the most interesting places. 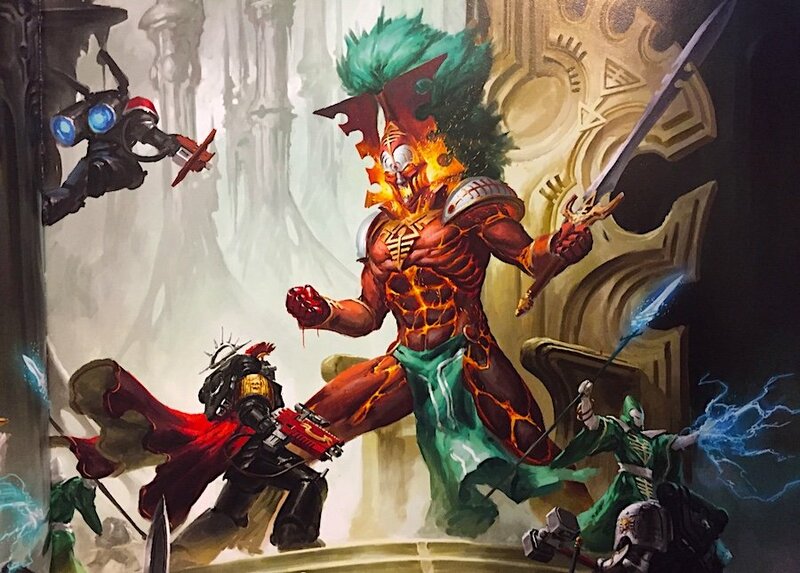 Kaela Mensha Khaine, the most unforgiving and fiery tempered of Eldar Gods – sits upon his corroded iron throne – in the beating center center of every Craftworld. The God of War has been fairly unloved since the beginning. You have to go all the way back to 2nd edition to see versions of his rules that inspired fear and respect. 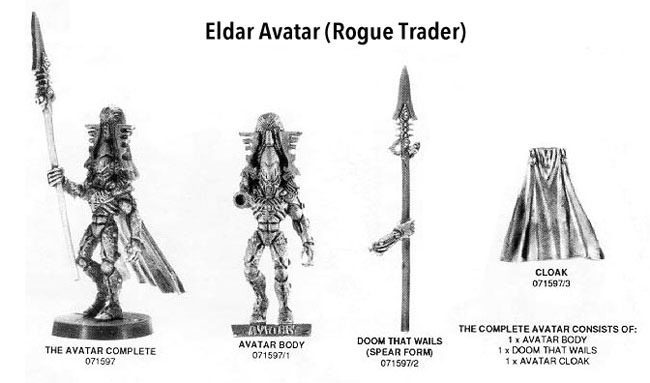 The Avatar on paper isn’t that bad, but is sidelined by all the other superior Eldar HQ options. There’s just not a lot of love about a middle-weight close combat model with all the other scary models in the game. Yup, he can certainly kill one tactical marine (who stupidly took his helmet off). 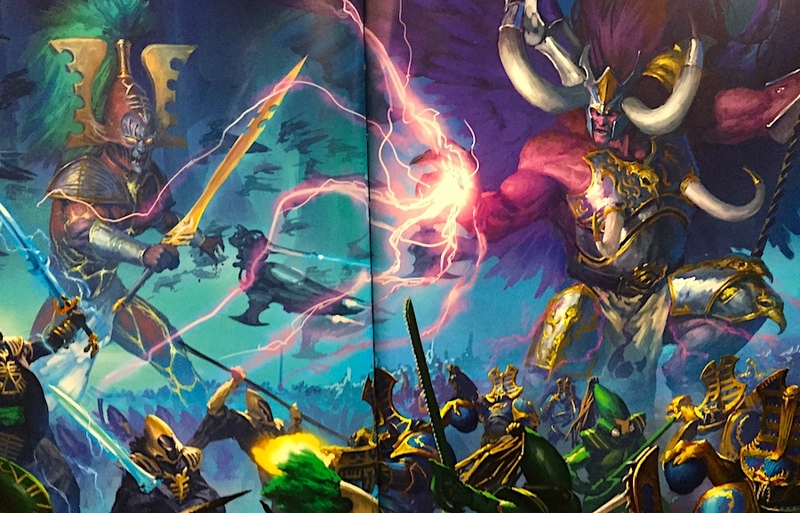 Next we need to go back to some of the lore and background of the Avatar hidden in fluff across the decades of GW writing. We all know the basic story. 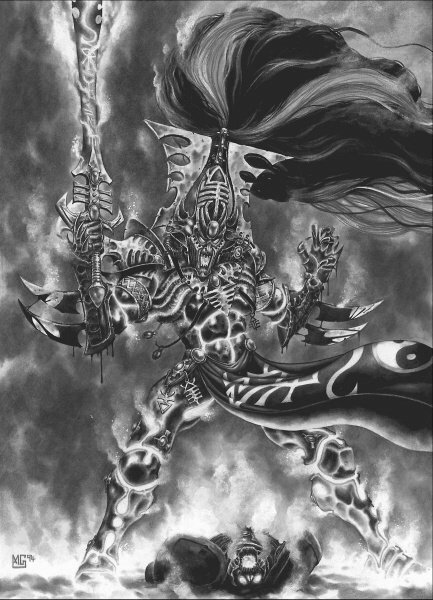 Slaanesh could not destroy Khaine and when he fell back to the material universe his essence splintered into shards, each of which took root in a Craftworld of the Eldar, to grow into the Avatars. What is generally not known is that these shards are not equal. 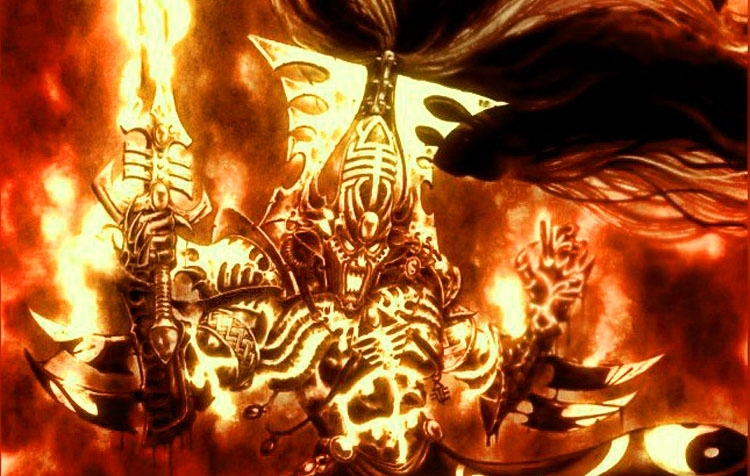 Thus each Craftworld’s avatar is a unique fragment of Khaine, in effect a giant collection of slightly different aspects of the God of War. Some are slightly smaller, or larger, and they wield different weapons from Avatar to Avatar. While the left hand drips blood eternally, the right hand may carry a wide array of weapons. You know what that really reminds me of from a modeling opportunity viewpoint? The Blood Thirster. Forge World – close but not quite… it’s proportions are just off enough to freak me out. 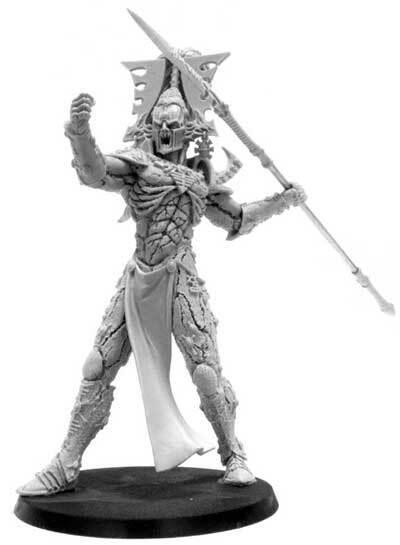 So imagine this for a new Avatar of Khaine plastic kit/rules. Make him twice as large. The size improvement is needed to make the model an army centerpiece and to justify his other rules and power improvements. The Avatar mini was quite the badass 20 years ago when the model was released – but in 2018, he’s a pipsqueak. His weapons are designed to give not only hobby options but rules options. His three weapons should affect his stats and like the Bloodthirster’s present various battlefield options. The sword – a pure assault offense, the spear – a potent ranged option, the halberd – a defensive buff. 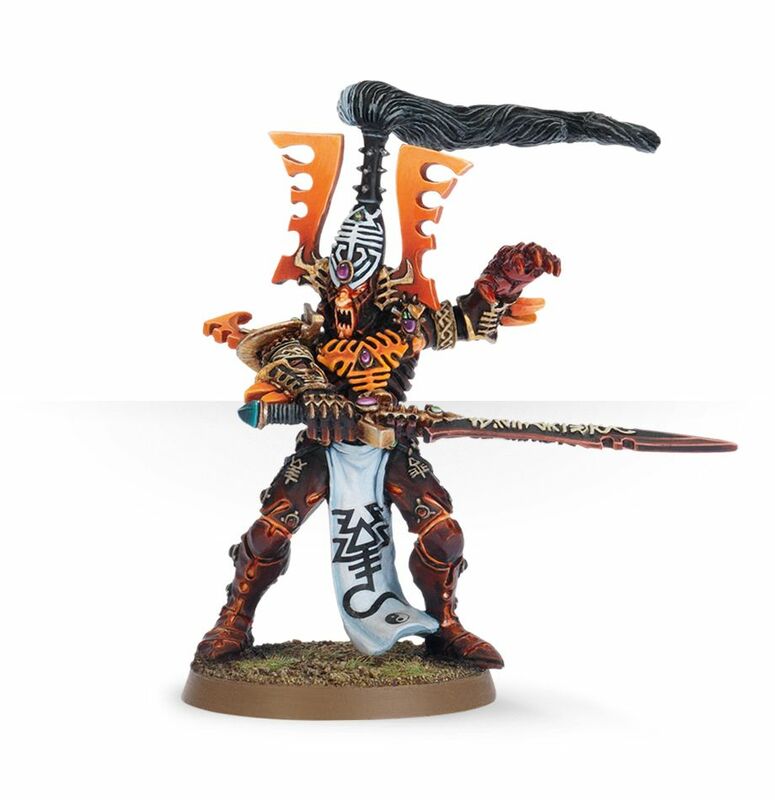 Finally up his points to be able to stand toe to toe with the major daemons of the various chaos powers. ~ I think he’s on the way, and not a moment too soon.